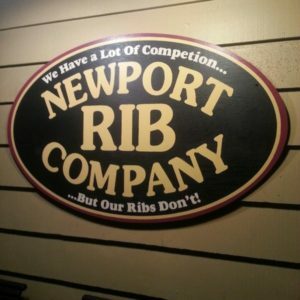 When you think about the best BBQ Ribs in town you can’t help but to think immediately of the Newport and Naples Rib Company. Family owned and operated since its inception 35 years ago, this premier BBQ joint is the real deal. Not only have they become a staple for customers looking to dine-in and enjoy some of the best BBQ in town but also for those looking to cater large events (think really large, like the Anaheim Angels and Boeing large!). In fact, fifty percent of their total business is for take-out and catering! That kind of success doesn’t just happen by mistake. It takes a seasoned team (most of the Rib Co. kitchen staff has been there over 20 years) and a die-hard commitment to consistency. So, no matter what day of the week and whether you dine-in or take-out, your food is exactly the quality you expect. Sounds simple, but it’s not and quite often the reason so many restaurants fail. The Rib Company has been built on a formula that works and you can be sure you won’t see that (or it’s amazing BBQ) changing any time soon. There’s so much more to being one of the most successful BBQ joints in Southern California, so we asked the experts (and one of our loyal customers) to give us some insights. Below is an incredibly informative interview with the Ursini family and a peak at how they’ve stayed at the top of their competitive industry for 35 years! Enjoy the interview and by all means – go enjoy some of their ribs! 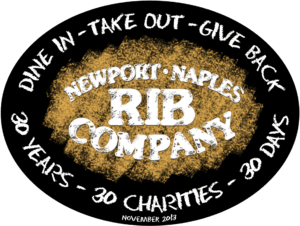 Question: Can you give me the background on founder Fran Ursini, the story behind the creation of the Newport & Naples Rib Companies and why he decided to open a BBQ joint? 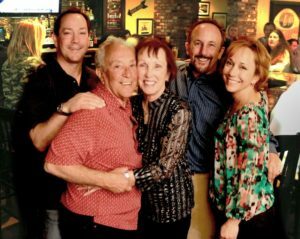 Answer: In 1984 my Dad, Fran Ursini, wanted to open a BBQ restaurant in Costa Mesa with another partner, Rich Penjoyan (who owned a Produce Market on Newport Blvd in Costa Mesa). In his search for the best BBQ in So Cal, Fran came across Naples Rib Joint on 2nd St in Long Beach and liked the menu and feel of the location. He and Rich then opened Newport Rib Co. on Newport Blvd next to Penjoyan Produce. Recipes were the creation of Fran’s cousin, Chef Ronaldo. The building was a former Meat Market. Question: How did the Ursini kids (John/Dave/Laura) eventually get involved in the family business and what are they each responsible for? Answer: About the time Fran and Rich were opening the Newport Rib Company, John was 19 and at UCLA. Dave and Laura were still in high-school. All three grew up working the various jobs (dishwasher, line cook, prep-cook, bus and server). It was something the three could work on week-ends home from college and during summers. After graduating UCLA, John worked for Gallo Wine in on-premise sales. In 1990, he left that job and came to work with Fran at Newport Rib Co. and began to build the catering business and work some evenings as a manager. 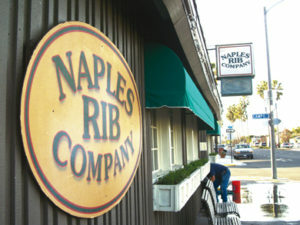 Then in 1992, the Naples Rib Joint in Long Beach came up for sale. Dave, who had graduated from USCB and was working at KPMG Peat Marwick as a CPA auditor, left to join Fran and John to run the two locations. Fran worked exclusively and Newport Rib, Dave worked at Naples Rib and John split his time between the two locations. Between the two locations, they were able to take things one did better and bring it to the other and vice versa. They created one great restaurant with two locations. Fast forward to 2013, and Laura, who had raised a Family, came to work at Newport Rib Co with Community Outreach and other projects. Question: As of now is it just the two locations in Newport and Long Beach? Are there plans to expand to other locations? Answer: We do have two locations now but had a 3rd in Ladera Ranch from 2005-2010. That location struggled when the recession hit in 2008. Future locations could be geared more towards Take-Out and Catering perhaps something in West LA (near UCLA) or in Huntington Beach (located between the current two locations). 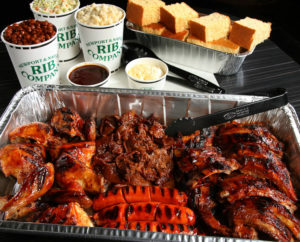 Question: How would you describe your menu at the Rib Company & has it changed much over the years? Answer: 90% of the items on our menu today were on it in 1984 when we first opened. Ribs/Chicken/Prime Rib/ Steaks have always been our staple (along with the Famou s Onion Brick). 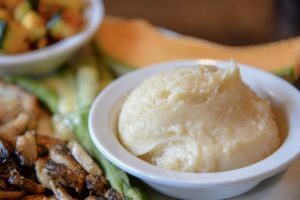 We’ve added a few items over the years like Slow Roasted Tri-Tip and some new salads and pastas. 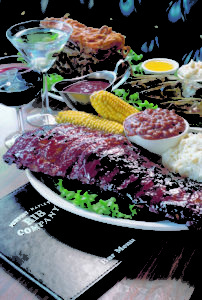 Still today, Baby Back Ribs account for 30% of every dollar sold. Question: You can’t be one of the best BBQ joints without having one of the best BBQ sauces in town. Do you make your own BBQ sauce and where did the recipe come from? Answer: Our BBQ sauce was first developed by Chef Ronaldo, Fran’s cousin, and was made daily in a 44-gallon trash can. The base was ketchup with about 25 other ingredients going into it. It is described as “Sweet with a Tang.” Since 1996, we have had a Commissary make the sauce which has kept it consistent. We even bottle it today. Question: What key things have made the Rib Company concept so successful in such a competitive industry? What makes your ribs stand above all else? Answer: Consistency in food and service is always the most important factor in a brand’s success. In fact, we have 7 back-of-the-house employees that have been with us for 20+ years. These are the employees who create and then finish off your meal each time you dine in or take out. Our average employee (including front-of-the-house) works for us for over 7 years. This is unheard of in the restaurant industry. We also work with the same vendors year after year and never take any short cuts on food quality. Community involvement has also been extremely important to our Brand’s longevity. We are all involved in various charitable organizations. We donate to numerous causes in the form of gift certificates and hold Fund-Raiser nights to help them raise funds to support their passion. 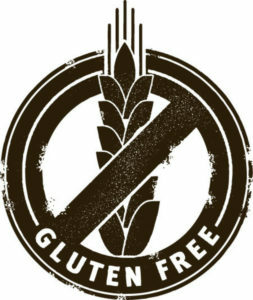 Question: I noticed gluten free options on the menu – what made you go this direction? Answer: In 2004, it was discovered that my sister Laura’s son couldn’t eat gluten. He was only 3 years old at the time and we all felt terrible knowing he couldn’t safely eat at our restaurants. This is when Laura had all our recipes analyzed. We created a detailed ingredient book and labeled our menu, so guests could confidently order when following a gluten free diet. We even designated a fryer gluten free so there is no cross contamination. In retrospect, it is ironic how some of our best business decisions are a result of caring for our loved ones. Question: Are there any interesting tidbits of history on the restaurant we haven’t covered yet? Answer: Over 50% of everything made inside our locations is eaten outside of the four walls. Take-out and off-site catering have become huge parts of our business. In 1984, Fran created our Party Packs which are a Take-out only item and consist of: Baby Back Ribs, BBQ Bone-in Chicken, Louisiana Hot Links, Beef Brisket, cornbread with honey butter and Two side orders (like BBQ Beans/Cole Slaw/Mac & Cheese/etc.) These packs feed 4-13 people (3 different sizes) and sell consistently. We’ve catered Events as large as 3,300 guests. Some of our larger Catering Clients are: LB State, UCLA, UCI, Longo Toyota, The Port of Long Beach and LA, Refineries in Wilmington and Carson, and various other businesses that know they can count on our food quality and quantity. We are known to respond quickly. With two days’ notice, we can cater anything. Question: Do you have any upcoming events to promote or charities you support? Answer: Being involved in the community is a family value that we prioritize in our business. Not only do we donate gift certificates to over a hundred fundraisers and events each year, but we sponsor charity golf tournaments, hold fundraiser nights and discount school banquets. In addition, each family member serves on a non-profit board. This Fall, our restaurants will be celebrating their 35th anniversary. To celebrate we will be hosting “35 Days of Charity” in which each restaurant donates 20% of all guest sales for 35 days to 35 local charities. It is a concept we began at our 20-year anniversary and have continued each 5-year anniversary. It is a wonderful way to commemorate our anniversary and give back to the community that has supported us for so long. To contact the Rib Company or see what they’re doing next go to www.ribcompany.com. All of us at Rogers Poultry would like to thank the Ursini Family and the Rib Company for allowing us to be a part of their journey and for the wonderful insights they provided. We hope it’s provides some value to our readers and invite all our customers to participate in our Customer Spotlight. If interested, simply contact your Rogers Sales Associate or call us toll free at 800.889.8280. Steam potatoes in pot for 45 minutes until tender and mix with remaining ingredients.